Public art is always a mixed bag – for every outdoor sculpture or mural that’s actually cool, there seems to be half a dozen others that are corny, ugly or both. So that’s why we have to give props to a group of small business owners in Ohio for installing a truly sweet tribute to the childhood game of paddle ball on the street. 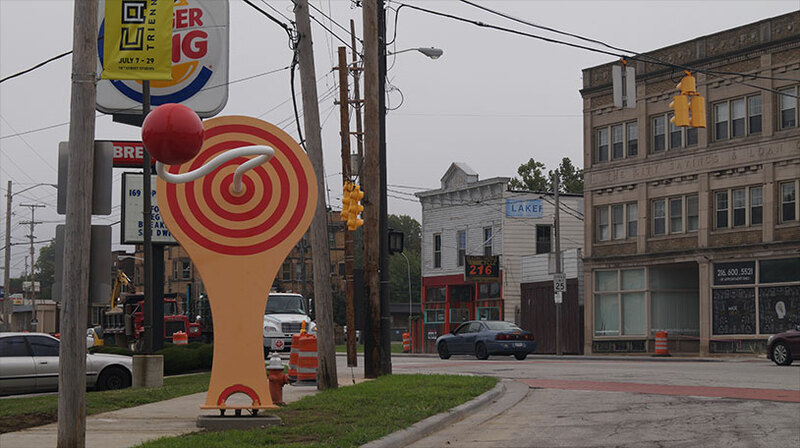 On Lake Road, just past Detroit Avenue, you’ll spot a massive wooden paddle with a red ball attached to it by what looks like a string frozen in mid-air. It’s a fun and funky sculpture that adds a touch of color and motion to the neighborhood. The three owners of the city’s Superelectric pinball parlor, Ben Haehn, Nathaniel Murray, and David Spasic, came up with the idea for the paddle ball artwork and commissioned LAND Studio to execute it with funding from Cleveland’s public arts program. City councilman Matt Zone remarked on the project “The paddle ball sculpture will serve as a symbol to everyone entering through the west side corridor that they have arrived in Gordon Square.” The group also hosted an attempt to beat the Guinness World Record for most paddle-ballers playing simultaneously. Read more at Cleveland Scene.